FAU may have won its Finale. 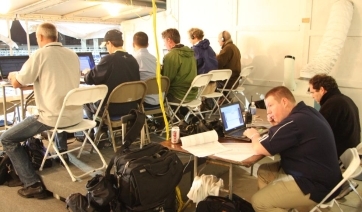 But this was also a contest for myself and my other FAU media colleagues who visited FIU Stadium for the first time; which was quite an experience. In my 30-year journalism career, I've never seen a press facility have a clear plastic canvas lowered to prevent rain from coming inside. The winds were blowing down the tables and the floor had to be mopped periodically. There was a story by one of the FIU Public Relations people that the side of a wall fell in the fourth quarter in a recent game and it would later be bolted to the top of the sheet metal roof. So while last year's game for myself was the best college game I've ever seen, this year's contest could be viewed as the best one I've barely seen. Sitting in the second row, the FIU spotter was right in front of me and I couldn't see the game. I kept getting up and walking around the press facility and occasionally outside to see the action. Nevertheless, the game continued on this rainy and windy night in Miami. My comments are by no means a criticism of the FIU Public Relations Staff. Their hospitality was great! The stories of their candid experiences were better. They just work here and I will admit that after visiting the FIU Campus for the first time, I was impressed with the campus, and when they do complete “Work In Progress Stadium,” it will be something to be proud of. They have the new Field Turf and I see where the room for the potential expansion. So, while FAU won't be going to a bowl game this year, they will take away some fond memories. And, now, so will I.